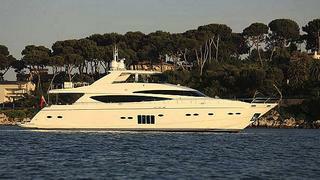 Jon Ford at Dbeere Yachts tells me he's listed the 24.91m motor yacht Princess Lily for sale. Built in 2010 by Princess Yachts, she was the flagship of the Princess fleet and was designed and built without compromise to deliver a contemporary and elegant yacht. With an abundant specification, and a rare five guest cabin layout, her features include: digital Trac stabilisers, the largest and most desirable 2434hp MTU engines, two generators, hard top roof, own yacht satellite internet, hydraulic bathing platform, optional bar in in the cockpit, underfloor heating to all bathrooms and a Jacuzzi in the master suite. MCA compliant, Princess Lily is lying in the South of France asking £3.6 million.